Dominoes are a great tool to use when teaching addition to your students. They easily lend themselves to use with addition because students can take the dots on one side of the domino and the dots on the other side of the domino and combine them together. I also find that my students think that dominoes are just the best thing ever. I wanted to share some domino activities with you that you can use when teaching addition. 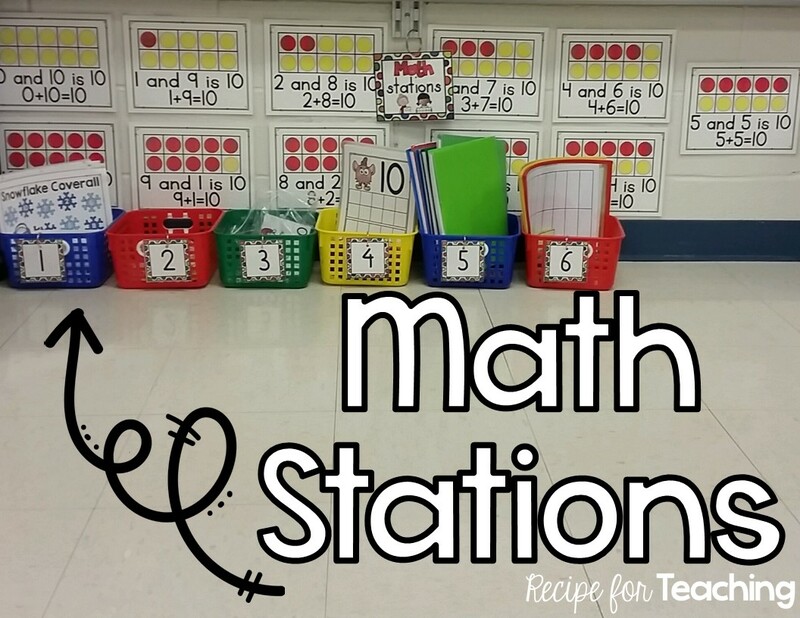 I have math stations (see the picture below for how I organize math stations) in my classroom and I like to do math activities with my students that can be put in a math station basket once they have learned the activity and can do it independently. 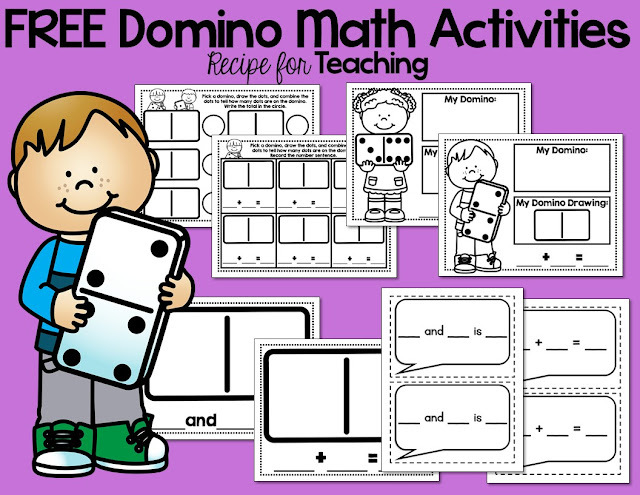 Once we learn these domino activities, they will be put out at a math station. I suggest printing the following domino resources and then laminating or putting in a plastic page protector for durability. For each domino activity, I have included a version where students are recording with and without the + and = symbols. 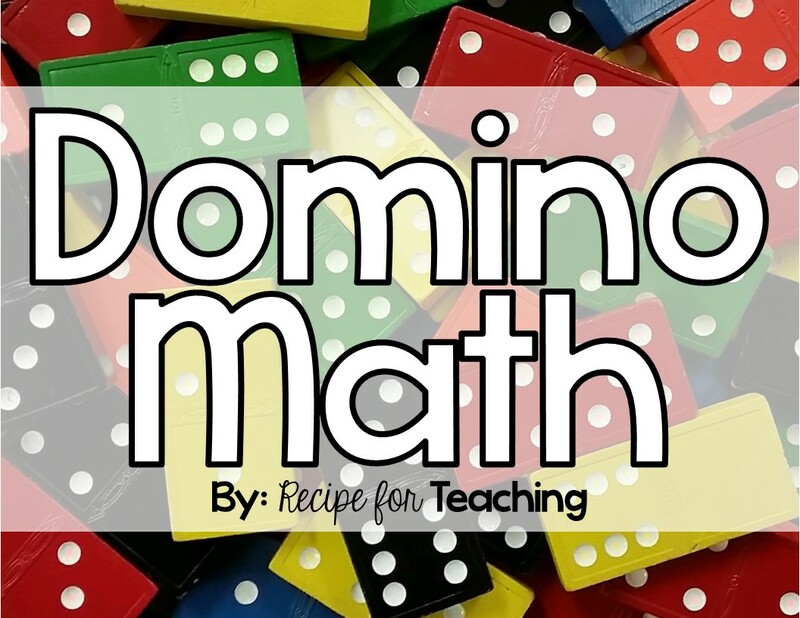 This is so you can easily differentiate the domino fun for your students who need to practice just combining objects and those who are ready to record the number sentence. Here students pick a domino, draw the dots, and combine the dots. Then, they write the total in the circle. This is great to use for early addition because you will notice there are no symbols. Students just need to combine the dots together and write the total. This is similar to the activity shown above, only now the + and = symbols are included. For this activity students pick a domino, draw the dots, and record the numbers on the correct lines to combine the dots. This is similar to the recording sheet shown above, but the + and = symbols are on this recording sheet for students who are ready to record the number sentences. For this activity, students use counters to represent the domino dots. Then, they record the numbers on the correct lines. This is similar to the above activity, only this has the + and = symbols. Math Talks are a great way to hold your students accountable for their math work. Students pick a domino, record the numbers, and then read the math talk to their friend. Some of my students like to hold it above their head like a speech bubble. If you are looking for some good math literature, Domino Addition is a great book to use when beginning addition instruction with dominoes. You can find it on Amazon by clicking here. You can grab all of these activities for FREE by clicking the image below! Happy Math Teaching! 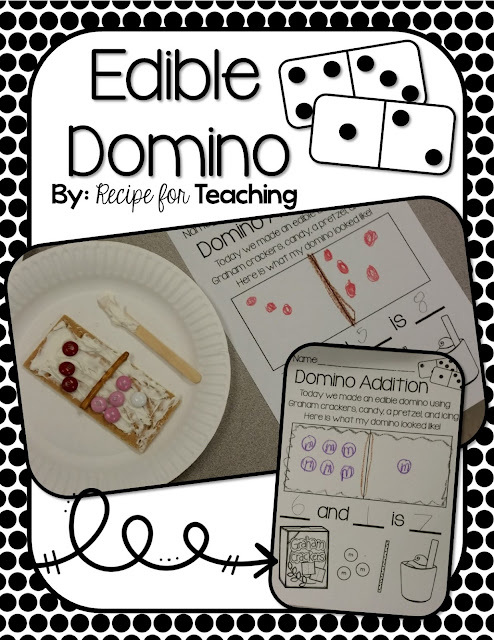 You also might enjoy reading my Edible Dominoes post. Just click the image to check out that post and grab another FREE download!